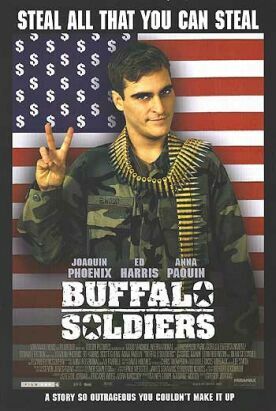 Though it may have been bad for the filmmakers, there is at least one good thing for audiences in the fact that Miramax had to postpone the release of Buffalo Soldiers after the events of September 11th, 2001 — and then again the following spring when focus groups tested badly, and then again earlier this year as the Iraq war loomed. For two years ago it would have been just a routine example of Hollywood’s bashing of the American armed forces and military life in general. Now it is a perfect time capsule from a vanished era of movie history. You will never again see a picture quite as bad as this one, or at least not bad in the same way. It’s easy to forget, now, the unrelieved bleakness of the cinematic prospect when it came to soldiers and soldiering between M*A*S*H (1970) and September 11. For more than three decades there was hardly a military hero to be found, unless he was first and foremost a victim of the time-servers, thugs and psychopaths that were supposed to have made up the preponderance of any military organization, or of the alleged insanity of military discipline itself. To be sure, by the 1990s the anti-war, anti-military ethos showed signs of degenerating into a parody of itself in such preposterous idiocies as The Rock or The General’s Daughter, but even the otherwise pro-military Saving Private Ryan was marred by a depiction of war as fundamentally senseless, apart from its eponymous rescue mission. Buffalo Soldiers, adapted from a book by Robert O’Connor and directed by the Australian Gregor Jordan, is solidly in the tradition of the preposterous idiocies. Its falseness begins with the opening voiceover by its hero, Ray Elwood (Joaquin Phoenix), who is a sort of Sgt. Bilko of the 1990s, dividing his time between ripping off the government and peddling drugs to his fellow soldiers. "Vietnam was a thorn in everybody’s side and led to the end of the draft. . ." he says, accurately enough, before going on to claim that, unable to recruit an all-volunteer force ("Who wants to play for a losing team? "), the services started recruiting from prisons. This is more than just factually inaccurate. It is a wilful distortion. The all-volunteer army has been made up since its inception not with jailbirds but with kids wanting money for college. If it had consisted of the sort of drugged out morons that we see in Buffalo Soldiers, they could hardly have continued to function even as the peacetime army they were in Germany before the fall of the Wall, which is when the film is set. At one point, for example, we see a tank crew, stoned out of their minds, going on a rampage through a German village, crushing cars ("Oh no! We squashed a beetle!" they giggle) and destroying small buildings and making people run for their lives. Finally, running over the pumps at a deserted gas station, they start a fire and explosion which kills two other soldiers transporting millions of dollars worth of weapons in two trucks which are otherwise unsecured. Coming upon the dead drivers of the trucks, Elwood, the cleverest of the morons, commandeers them and hides their contents at another base nearby before trading them to a Turkish arms dealer for a shipment of heroin. Sure he did. I guess he was just lucky that there were no by-standers, no consequences for the drug-addled tankers and, apparently, no curiosity on the part of the army about the two truckloads of missing weapons. Ed Harris, reprising his role as the idiot colonel in The Rock, is only interested in his own career and depends entirely on Elwood for information about what is going on on his post — two facts between which a real colonel might be expected to notice a certain contradiction. This colonel notices nothing, not even that while Elwood is sucking up to him he is screwing his wife. The army, in the shape of Sgt. Robert E. Lee (Scott Glenn), does eventually take an interest in Elwood’s activities, but Sgt. Lee has not only a pretty daughter (Anna Paquin) who hates him (naturally) but guilty secrets of his own, and Elwood’s criminal career is allowed to proceed without further hindrance. Of course this state of affairs provides the occasion for a great number of heavy handed ironies as we notice that the base is festooned with gung-ho slogans like "Ready Every Day" or "Be All You Can Be" and that on the risers of the stairs which these soldiers mount to higher things are painted the virtues — Confidence, Standards, Loyalty, Esprit etc. — on which some deluded idealist, possibly the colonel himself, imagines they will do the same. Two years ago, as I say, audiences might have been prepared to accept this version of life in the U.S. Army. It had at least the merit of being familiar at the time. But since then the U.S. Army has shown that it knows how to do something besides providing career opportunities for drug dealers and black marketeers, and concealing their activities and its own corruption from the public gaze. Even those who disapprove of America’s military adventures are now unlikely to see this movie as anything but the bunkum it is.